As part of International Women’s Day 2017, we profile some of the senior women at City, University of London. Today we interview Susannah Marsden, Director of Student and Academic Services. 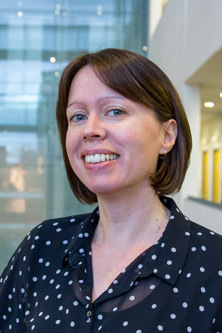 Susannah Marsden is Director of Student and Academic Services at City, University of London. She started her career at City as a Course Officer and has progressed through a variety of increasingly senior roles. Through her passion for the performing arts, Susannah has been on the Board of Governors for the Conservatoire for Dance and Drama and Deputy Chair of the Board of Trustees for the National Centre for Circus Arts and also undertaken consultancy work for other world-leading conservatoires. What does the role of Director of Student and Academic Services entail day-to-day? One of the interesting parts of my job is no one day is the same! Overall, my role is about empowering my colleagues to ensure the Directorate is providing the right type of support to our students, staff and external partners; working in collaboration with other members of City’s Executive and the Students’ Union in developing and implementing plans to enable the future development of City’s educational offer and student experience; keeping a watchful eye on external developments and managing how City responds to that; and lots of meetings – about 75% of my time is spent in meetings at City or with colleagues in the sector. Time management is critical as everyone wants a piece of you - sometimes I could do with a twin! I learn something new about something or someone every day. You manage a very large department, what is the secret to good people management? I think people management is the toughest part of any leadership role and the one that determines real success and impact. Student and Academic Services has grown from 65 to 125 people since I was appointed to my role 3 years ago. We are not only broad in the scope of our work but we are also based on 6 different sites. In my view, good people management is about showing people that they really matter through listening, communicating, recognising their differences and taking time to understand (not just hearing). It is also about motivating and empowering staff, being honest about and supportive of their development needs, nurturing talent and giving direct credit for their personal successes. That is quite a menu of secrets! Sometimes it is not possible to offer the full menu all of the time. Always maintaining the listening and empowering components is a pretty good starter course. You are very involved in mentoring and mediation, how did you start that? Throughout my life to date I have regularly had good role models around me who encouraged me to be the best I could be. That line is quite important – it’s not about being the absolute best but about always fulfilling your potential. That experience, combined with being told I was a good listener, led me to a position where I thought I might be able to give something back to others who were seeking to explore and better themselves. I am a mentor for three schemes (Leadership Foundation for Higher Education Aurora programme, AUA PG Certificate in Leadership and Management and the Professional Mentoring scheme at City) as well as a coach on City’s new coaching network. It is incredibly rewarding as the mentee/coachee usually leaves the meeting more positive about themselves than when they arrived. My desire to become a trained meditator was similarly fuelled by wanting to enable people reach a better place in their workplace relationships and I recently completed a National Certificate in Workplace Mediation – it was also great to be back in a formal learning setting and using bits of your brain that may have been having a little snooze.